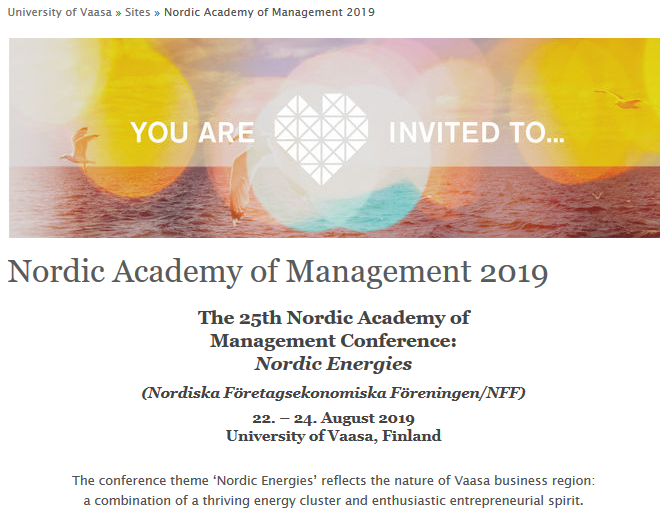 The 25th Nordic Academy of Management Conference NFF 2019 will be held in Vaasa, August 22nd-24th, 2019. There will be altogether 33 tracks in the conference, which will be preceded by a doctoral tutorial. The track "Business models for the real-time economy" will be organized by the MAI researchers Petri Ahokangas (Chair), Minna Pikkarainen, Timo Koivumäki and Veikko Seppänen. The deadline for the submission of abstracts (800 words) is February 15th, 2019. Their acceptance will be informed by the end of March and the deadline for the full papers is June 23rd, 2019.